Aim: To analyze the outcomes after transarterial chemoembolization (TACE) including radiological response and liver decompensation, and their predictive factors. Methods: Sixty two hepatocellular carcinoma patients underwent transarterial chemoembolizaton. Laboratory data, tumor criteria, and Child-Pugh score were recorded baseline and at one month post-procedure. Tumor response according to Modified Response Evaluation Criteria in Solid Tumors was evaluated. Results: Twenty five patients (40.3%) showed complete response, 15 patients (24.2 %) showed partial response, 2 patients (3.2%) showed stable disease and 20 patients (32.3%) showed progressive disease. Significant difference was detected in patients with different radiological responses as regards tumor criteria (size, invasion of portal vein, Barcelona Clinic Liver Cancer stage), and technique of TACE. Thirty six patients (58%) had liver decompensation after TACE. Tumor criteria, serum bilirubin, AST, INR, Model for End Stage Liver Disease, and low platelet count were detected to be predictors of as radiological response and liver decompensation after TACE. Conclusion: Radiological response cannot be considered alone to determine the outcomes after transarterial chemoembolization. Also, tumor criteria, liver functions, and platelet count are predictors of the outcome. Transarterial chemoemolization (TACE) is widely used as a palliative therapy for intermediate stage and unresectable HCC. It has the combination of target tumor chemotherapy and ischemic necrosis due to arterial embolization. TACE is found to improve survival comparing with supportive care.1 Contraindications of TACE are advanced liver disease (Child Pugh≥8), hepatic encephalopathy, refractory ascites, active gastrointestinal bleeding, renal impairment, and advanced tumors (bilobar, main vascular invasion, or extra hepatic metastasis).2 However, patients with extensive disease or deteriorated liver function may have greater risk of complications. The point at which this risk outweighs the benefits remains undefined (Figure 1).3 One of the most important complications of TACE is liver decompensation. Elevation of liver enzymes and negative changes of liver function tests are observed in many patients after procedure. Also evidence of new ascites, hepatic encephalopathy, or worsening of anyone of them which is already present can be observed. The development of the selective and super selective techniques minimized the rates of hepatotoxicity. In patients with preserved liver function, and serum bilirubin < 2.0 mg/dL), the rate of irreversible liver decompensation decreased from 20% in nonselective chemoemblization to 3% in selective or super selective ones.4,5 Radiological response after transarterial chemoemolization (TACE) is classified according to Modified Response Evaluation Criteria in Solid Tumors (mRECIST) to: complete response (CR) (disappearance of arterial enhancement), partial response (PR) ( at least a 30% decrease in the sum of diameters of viable enhancement), progressive disease (PD) (an increase of at least 20% in the sum of the diameters of viable enhancement, or appearance of new lesions), and stable disease (any cases that do not qualify for either partial response or progressive disease).6 However, radiological response is not the only factor predicting TACE outcomes. The best radiological response only does not mean good prognosis.7 Studies detected that other factors (TACE procedure, tumor burden, liver functional status, and health status) had an effect on TACE outcomes.8 Indeed, patients who are eligible for TACE are widely heterogeneous (due to different tumor extension, and different stages of liver functions). Therefore, tailored approach is required to optimize the clinical outcomes in each patient.9 We assessed patients before and after TACE in order to determine which factors might predict TACE outcomes. 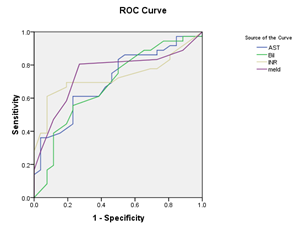 Figure 1 (a) Reciever operating characteristic (ROC) curves show relation baseline serum bilirubin, AST, INR, and MELD score and decompensation after TACE, with area under curve=0.707, 683, 731, 751, and P value =0.006, 0.014, 0.002, 0.001 respectively. 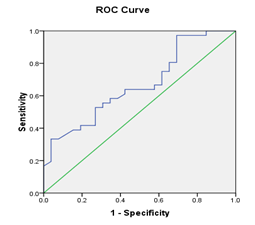 (b): Recieveroperating characteristic (ROC) curve shows relation between score and decompensation after TACE. , with area under curve=0.669, P value =0.024 (significant). This prospective study was carried out on 62 patients in one year period between June 2014 and June 2015. This study was approved by local ethical committee of Tanta Faculty of Medicine; Tanta Faculty of Medicine, Tanta University, Egypt. Hepatocellular carcinoma patients received by Tropical Medicine and Infectious Diseases Department in Tanta University Hospitals, and Interventional Radiology Unit of Ain Shams University Hospitals and were candidate for transarterial chemembolization (TACE) were included in this study. Patients with advanced HCC (extra hepatic metastasis, or main vascular invasion), impaired liver functions (marked ascites, jaundice, or Child C patients), bad general condition, severe bleeding tendency, renal insufficiency, pregnant females, and patients who refused participation in the study were excluded. Informed consent was taken from every patient after explaining the whole procedure. Demographic data were collected. All patients were evaluated before and one month after TACE. Clinical examination, laboratory investigations (including liver, renal functions, complete blood count, alpha-fetoprotein), and radiological investigations including abdomino-pelvic ultrasound and triphasic abdominal CT with contrast were done. Staging of HCC according to BCLC and severity of liver disease (according to Child-Pugh score, and Model for End Stage Liver Disease (MELD) score) were evaluated. Radiological tumor response according to Modified Response Evaluation Criteria in Solid Tumors (mRECIST) assessment was measured for all patients by one radiologist. *A 5-french vascular sheath was placed into the common femoral artery over a0.035-inch guide wire. Under fluoroscopic guidance, a5-french glide cobra catheter (Cordis) was advanced into the aorta. An angiographic study of the superior mesentericartery (SMA), celiac trunk and common hepaticartery was performed to identify arterial blood supply of the focal lesion, and evaluate the patency of the portal vein. The arterial branches feeding the tumor were selectively cannulated by microcatheters. Anticancer drug "Doxorubicin hydrochloride” (adriamycin) in oil emulsion was prepared as follows: [dissolving 50 – 100 mg of doxorubicin in 5 ml of a fluid with specific gravity equivalent to that of iodized oil (this fluid was prepared by adding 10 ml of urograffin to 2 ml of distilled water)]. This dissolved doxorubicin was mixed with iodized oil in a ratio of 2-3:1respectively. The doxorubicin in oil emulsion was injected through the catheter into tumor vascular bed under screen. The embolic material gelatin sponge (gel foam) particles 1–3 ml in diameter was injected to occlude the tumor vascular bed and feeding arteries. Demographic data: The study included 62 patients; 49 (79%) were males and 13 (21%) were females. The overall mean age was 58.24±7.36 years (range: 42-80) (Table 1). Tumor criteria: Most patients 55 (88.7 %) had unilobar tumors, most of them38 (61.3%) were in the right lobe. Thirty one patients (50%) had a single nodule, 19 (30.6%) patients had two nodules, and 12 (19.4%) patients had more than two nodules. The overall mean size of the lesions with 2 dimensions (2D) was 36.23±38.4 cm2 (range: 1.21–180). Twenty patients (32.3%) were Barcelona clinic liver cancer (BCLC stage A), 33 patients (53.2%) were stage B, and 9 patients (14.5%) were stage C (due to tumor invasion of portal vein branch). Transarterial chemoembolization (TACE): Two sessions of TACE were performed in 9(14.5%) patients. However, the remaining 53(85.5%) patients needed only one session. TACE was super selective in 41(66.1%) patients, and selective in 21(33.9%) patients. Radiological response after TACE: According to Modified Response Evaluation Criteria in Solid Tumors (mRECIST), complete response (CR) occurred in 25(40.3%) patients, partial response (PR) was in 15(24.2%) patients, stable disease (SD) was in 2(3.2%) patients, and progressive disease (PD) was in 20 (32.3%) patients. Laboratory findings: The only significant changes in laboratory findings one month post procedure were increased total serum bilirubin, aspartate transaminase (AST), MELD score, and decreased serum albumin and hemoglobin. There was no significant difference as regards alanine transaminase, INR, alpha-fetoprotein, white blood cells, platelet count, or renal functions (Table 2). As regards classification of patients according to radiological response, no significant statistical differences between groups were detected as regards laboratory findings (except in hemoglobin and platelets), or as regards decompensation one month after TACE. Significant statistical differences were detected in tumor criteria (number of involved segments, vascular invasion, size, BCLC), and selectivity of TACE procedure (Table 3). In univariate analysis, tumor size, vascular invasion (BCLC stage C), selective TACE, and increase TACE sessions were predictors of progressive disease. Multivariate analysis was run, and revealed that vascular invasion (odds ratio 8.326, ρvalue =0.013 at 95% CI), selective TACE (odds ratio 4.593, ρvalue=0.02 at 95% CI) and increase TACE sessions (odds ratio 6.844, ρvalue =0.024 at 95% CI) were the statistically significant independent factors predictive of PD after TACE. Size (2D) (cm2) with cut off value (40.87), sensitivity 55%, specifity 83.3%, and positive predictive value 61.1% was detected to be associated with progressive disease after TACE (Table 4) (Table 5). Decompensation after TACE (increase Child Pugh score one or more than the score before TACE). Decompensation of cirrhosis occurred in 36 (58%) patients. Clinical manifestations and Child Pugh score is shown in Table 5. Univariate analysis was performed to compare patients who remained on the same Child Pugh score after TACE, and those who had Child Pugh score increased for the different pre-procedure variables that might predict decompensation post-procedure. There was no significant difference between them as regards gender, age, and smoking. Comparison of baseline laboratory data was made between them. The mean serum bilirubin, AST, INR, and Model for End Stage Liver Disease (MELD) score were significantly higher, and mean serum platelets was significantly lower in patients who decompensated after TACE. There was a significant difference in the baseline Child-Pugh scores between them. However, there were no statistically significant differences as regards tumor criteria, BCLC staging, and radiological response. From the above univariate analysis, serum bilirubin, AST, INR, MELD score, low platelet count, and also left lobe tumors were the statistically significant factors predictive of decompensation after TACE. Multivariate analysis was run, revealing that AST (ρvalue =0.024 at 95% CI) and INR (ρvalue=0.012 at 95% CI) were the statistically significant independent factors predictive of decompensation after TACE (Table 6). 34 (54.8%) with a score of A5, 18 (29%) with a score of A6. Univariate analysis detected that serum bilirubin, MELD score, low platelet count, and also left lobe tumors, and heterogeneous and non-enhanced lesions were predictive factors of decompensation after TACE. In addition; AST and INR were also detected to be independent predictive factors of decompensation on multivariate analysis. Other tumor criteria and BCLC stages were not predictive factors of decompensation. This is in agreement with Kohla19 who detected significant statistical difference between decompensated patients and those who did not show decompensation as regards serum bilirubin and INR. However; serum albumin, BCLC staging, and number of HCC nodules were also significantly different between groups. Siriwardana20 detected significant difference regarding serum platelets and albumin between those patients who presented with liver failure and those who did not. In this study, decompensation is associated with basal serum bilirubin≥1.45 mg/dl, AST level≥77.5 IU/L, INR≥ 1.2, Model for End Stage Liver Disease (MELD) score≥8.5, and Low platelet count≤ 80x109/L. In a study made by Tasneem;21 decompensation was found to be associated with pre procedure serum albumin levels less than 2.8gm/dl, Child Pugh score>7, and MELD score >10. However, no statistically significant association was observed between liver decompensation and tumor size, transaminases, basal INR, or alphafetoprotein levels. The limitations of our study were the small number of patients and that not all patients were evaluated for histological proof of HCC. However, the risk of misdiagnosis was minimized by the fact that our protocol applied the criteria suggested by the EASL for the diagnosis of HCC, for which liver biopsy is not always necessary in the presence of confirming cross-sectional contrast enhanced radiological studies.26 Also, one of the limitations was the lack of data regarding inter-observer variation in the assessment of tumor response to TACE because imaging studies were evaluated by only one radiologist. To summarize, Patients are to be evaluated prior to transarterial chemoembolization as regards liver function, tumor burden, and BCLC stage. Good radiological response cannot be considered alone to as better outcome. Proper patient selection means better outcome, and lower risk of liver decompensation. Tumor criteria (size, left lobe tumors, heterogonous enhanced lesions, and vascular invasion), BCLC stage, TACE technique, serum bilirubin, AST level, INR, MELD score, and low platelet count are independent predictors of TACE outcomes as regards radiological response and liver decompensation. Omata M, Lesmana LA, Tateishi R, et al. Asian pacific association for the study of the liver consensus recommendations on hepatocellular carcinoma. Hepatol Int. 2010;4(2):439–474. Raoul JL, Sangro B, Forner A, et al. Evolving strategies for the management of intermediate-stage hepatocellular carcinoma: available evidence and expert opinion on the use of trans-arterial chemoembolization. Cancer Treat Rev. 2011;37(3):212–220. Garwood ER, Fidelman N, Hoch SE, et al. Morbidity and mortality following transarterial liver chemoembolization in patients with hepatocellular carcinoma and synthetic hepatic dysfunction. Liver Transpl. 2013;19(2):164–173. Chan AO, Yuen MF, Hui CK, et al. A prospective study regarding the complications of transcatheterintra arterial lipiodol chemoembolization in patients with hepatocellular carcinoma. Cancer. 2002;94(6):1747–1752. Groupe d’Etudeet de Traitement du Carcinome Hepatocellulaire. A comparison of lipiodol chemoembolization and conservative treatment for unresectable hepatocellular carcinoma. N Engl J Med. 1995;332:1256–1261. Lencioni R, Llovet JM. Modified RECIST (mRECIST) assessment for hepatocellular carcinoma. Semin Liver Dis. 2010;30(1):52–60. Henry JC, Malhotra L, Khabiri H, et al. Best radiologicalresponse to transarterial chemoembolization for hepatocellular carcinoma does not imply betteroutcomes. HPB (Oxford). 2013;15(3):196–202. Vogl TJ, Naguib NN, Nour-Eldin NE, et al. Review on transarterial chemoembolization in hepatocellular carcinoma: palliative,combined, neoadjuvant, bridging, and symptomatic indications. Eur J Radiol. 2009;72(3):505–516. Cabibbo G, Latteri F, Antonucci M, et al. Multimodal approaches to the treatment of hepatocellular carcinoma. Nat Clin Pract Gastroenterol Hepatol. 2009;6:159–169. Hanley JA, McNeil BJ. The meaning and use of the area under areceiver operating characteristic (ROC) curve. Radiology. 1982;143(1):29–36. Kim DJ, Clark PJ, Heimbach J, et al. Recurrence of hepatocellular carcinoma: importance of mRECIST response to chemoembolization and tumor size. Am J Transplant. 2014;14:1383–1390. Haywood N, Gennaro K, Obert J, et al. Does the degree of hepatocellular carcinoma tumor necrosis following transarterial chemoembolization impact patient survival? J Oncol. 2016;2016:4692139. Chen CS, Li FK, Guo CY, Xiao JC, et al. Tumor vascularity and lipiodol deposition as early radiological markers for predicting risk of disease progression inpatients with unresectable hepatocellular carcinoma after transarterial chemoembolization. Oncotarget. 2016;7(6):7241–7252. Al-shatouri MA, Ahmad AT, Amer TA, et al. Size of hepatocellular carcinoma as a predictor of radiologic response to transarterial chemoembolization. J Cairo Univ. 2014;82(1):743–747. Georgiades CS, Hong K, Geschwind JH, et al. Safety and efficacy of trans-arterial chemoembolization in patients with unresectable hepatocellular carcinoma and portal vein thrombosis. J Vasc Interv Radiol. 2005;16(12):1653–1659. Marelli L, Stigliano R, Triantos C, et al. Transarterial therapy for hepatocellular carcinoma: which technique is more effective? A systematic review of cohort and randomized studies. Cardiovasc Intervent Radiol. 2007;30(1):6–25. Khan KN, Nakata K, Kusumoto Y, Shima M, et al. Evaluation of non-tumorous tissue damage by transcatheter arterial embolization for hepatocellular carcinoma. Cancer Res. 1991;51(20):5667–5671. Munk PL, Ho SGF, Legiehn GM, et al. Chemoembolisation of hepatic tumours: changes in platelet count, haemoglobin, and creatinine postembolisation. J HK Coll Radiol. 2002;5:14–18. Kohla MAS, Abu Zeid MI, Al-Warraky M, et al. Predictors of hepatic decompensation after TACE for hepatocellular carcinoma. BMJ Open Gastro. 2015;2(1):e000032. Siriwardana RC, Niriella MA, Dassanayake AS, et al. Factors affecting post-embolization fever and liver failure after trans-arterial chemoembolization in a cohort without background infective hepatitis-a prospective analysis. BMC Gastroenterol. 2015;15:96. Tasneem AA, Abbas Z, Luck NH, et al. Adverse events following transarterial chemoembolization for hepatocellular carcinoma and factors predicting such events. J Pak Med Assoc. 2013;63(2):239–244. Trevisani F, De NS, Rossi C, et al. Randomized control trials on chemoembolization for hepatocellular carcinoma: is there room for new studies? J Clin Gastroenterol. 2001;32(5):383–389. Sheta E, El-Kalla F, El-Gharib M, et al. Comparison of single-session transarterial chemoembolization combined with microwave ablation or radiofrequency ablation in the treatment of hepatocellular carcinoma: a randomized-controlled study. Eur J Gastroenterol Hepatol. 2016;28(10):1198–1203. Ziada DH, El Sadany S, Soliman H, et al. Prevalence of hepatocellular carcinoma in chronic hepatitis C patients in Mid Delta, Egypt: A single center study. J Egypt Natl Canc Inst. 2016;28(4):257–262. Abd-Elsalam S, Elwan N, Soliman H, et al. Epidemiology of liver cancer in Nile delta over a decade: A single-center study. South Asian J Cancer. 2018;7(1):24–26. European association for study of liver, european organisation for research and treatment of cancer. EASL-EORTC clinical practice guidelines: management of hepatocellular carcinoma. Eur J Cancer. 2012;48(5):599–641. © 2018 Elkadeem et al. This is an open access article distributed under the terms of the Creative Commons Attribution License , which permits unrestricted use, distribution, and build upon your work non-commercially.